Lockwiki is the home of all things related to the security and compromise of locks, safes, and keys. This site is a community-driven reference for both beginners and professionals in the security industry. On this site you will find information regarding the installation, maintenance, disassembly, and compromise of locking devices. In addition, information on specific models, brands, and companies in the physical security industry are available. Use the links below to familiarize yourself with the site. The primary language for this site is English, please contribute if you would like to see it expanded to other languages! LockWiki is made possible by many dedicated contributors. 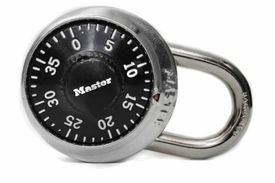 Our goal is to provide a free reference on locks, safes, and related technology to the public. There are lots of ways you can help contribute, too! 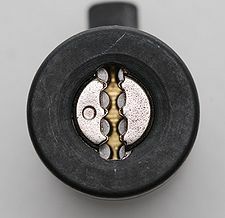 The TuBAR is a dual-sidebar lock made by CompX Chicago. It is distinguished for being one of the few cam locks to use a sidebar without major modifications to the sidebar mechanism. The TuBAR was originally produced by Chicago Lock Co., which has since become CompX Chicago. 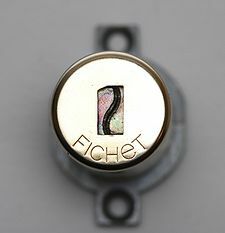 The 787 is a lever lock made by Fichet. The 787 uses 8 or 10 levers and a series of gears that interface with a fence at the rear of the lock. In function, the 787 is a mix of lever, combination, and disc-detainer lock designs. This page was last modified on 22 July 2009, at 09:51. This page has been accessed 1,094,975 times.